Lying is Obama's favorite weapon in the debt-ceiling battle. The alternative media has been calling Mr. Obama a liar and worse for quite some time. His State of the Union (SOTU) messages are rich in untruths, told right in front of our elected representatives solemnly assembled. Googling "Obama tells us" turns up skeptical reactions from all over the world such as these from Canada and Israel. The WaPo was commenting on the White House's assertion that the Republican-driven DC school voucher system hadn't improved test scores despite plain evidence that not only had the private schools done a better job than the union-dominated public schools, they'd done a better job for less money per pupil. The Journal has it right - not letting the government borrow any more doesn't stop government spending because tax money still flows to Washington. They can spend what they take in without increasing the debt, just not a penny more. The is Mr. Obama's dilemma - his Democrat-dominated Congress authorized massive amounts of spending so he could take care of people who vote for him. Unless he can get the new Republican Congress to let him raise the debt ceiling, he'll have to spend less than Congress said he could. That would be terrible - he and he alone would have to decide to pay some and not to pay others. His preferences would stand revealed for all to see. He might spend the Social Security money on something else, for example. For years now, America has been spending more money than we take in. The result is that we have too much debt on our nation's credit card — debt that will ultimately weaken our economy, lead to higher interest rates for all Americans, and leave us unable to invest in things like education, or protect vital programs like Medicare. What a whopper! 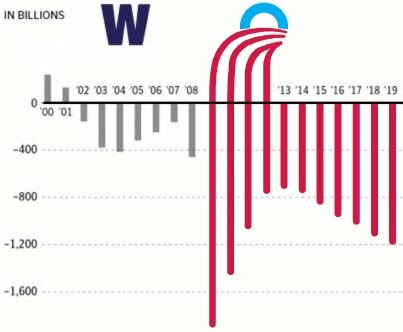 It's true that debt went up under the Bush (R) administration - but his biggest debt increase was in Mr. Bush's last years when Congress was dominated by big-spending Democrats. Debt exploded after the Democrats took over the Senate in 2008 - not one Republican voted for the huge costs of Obamacare. He's trying to duck the blame for his fiscal sins. But the American people deserve the truth from their leaders. And the truth is, you can't get rid of the deficit by simply eliminating waste and fraud, or getting rid of pet projects and foreign aid, like some have suggested. Those things represent only a tiny fraction of what we spend our money on. This sounds very reasonable and measured, but Mr. Obama always sounds reasonable when he tries to prolong his unaffordable vision of a society that takes care of everyone regardless of cost. There are two problems with his plan, and they're serious enough for us to call the whole thing a lie. There simply aren't enough rich people to cover the costs of government as Mr. Obama sees it To do that, he'd have to raise taxes to the point that there'd be no reason for anyone to work any more. We've heard this song before. When the first Mr. Bush was president, he cut a deal with the Democrats to raise taxes in return for spending cuts. The tax increases went in, but the Democrats broke their promise and never cut spending. Having watched the Democrats do the same thing to President Reagan years before, we were agog and aghast at seeing Mr. Bush get sucked in by the same lie. Having raised taxes without cutting spending, Mr. Bush I lost his re-election bid to Mr. Clinton. No matter what Mr. Obama says, there's no way anyone can trust a Democrat's promises about cuts. To paraphrase a Supreme Court justice, we say, "The only way to cut spending is to cut spending." Congress, do not increase the ceiling no matter what! Shutting off the credit card would force a spending cut of about 30%. Let's see who Mr. Obama funds and whom he stiffs. Then we'll know what his spending priorities really are, and either way, we'll owe less. It irks the dickens out of me when a spade is called a hand operated earth moving implement. No one, not even our fearless golfer nor the newspaper can "make up facts". Facts are real - that is a matter of fact. The rag that calls itself a newspaper is afraid of calling our alleged president a liar. But that is what he is. When someone makes something up out of thin air it is a lie, not a made up fact. People who lie are liars. That is a fact. One who lies is a liar that is the proper definition. One can make up a lie and call it a fact, but one cannot make up a fact. Why is the Main Stream Media so afraid of calling a spade a spade? The fool in the White House is a liar. There are a few points to make here on this article. The congress and obama are in agreement that we have a problem but both refuse to identify the entity that caused the problem. It is of course congress and the White House. Congress presented the bills to the president and he signed them. I am taking into account only the last 10 years though it started prior to this time frame. At any rate, they are rattled about what to do about the crisis that they have caused and turn to the American people for the answer. A majority of the public says to cut spending and be fiscally responsible. They do not like that solution so they come up with voodoo solutions and cut spending 10 years out. They even seem proud that they have come up with this brilliant solution as they parade it to the podium to announce to the nation that they have the answer to save the nation. A second point is that these same politicians are talking about saving the American way of life for our grandchildren. This is the same speech that we heard 40 years ago. Take a look at how our debt has exploded and guess who is having to shoulder that burden. Yes that's right, the grandchildren of those politicians who are having to pay for their excesses. The politicians of 40 years bought the vote with spending programs and they are now all gone. The debt is still here. We are paying high taxes because of them. Our children and grandchildren will get the bill later and it will be worse than today. We have to draw a line in the sand and cut spending by closing down bureaucratic departments, much of foreign aid, many overseas military posts, and the fed. It will be hard but it can be done. One more quick point, a point that I continue to make at every occasion, pass the Fair Tax Act to release our economy. You are right. It is the executive and the legislative branches of our government that have caused the problems. But we elected them. Politicians of all stripes and colors promise the American people that, once elected, the politicians will spend the voters' money for the voters. The American people have been taught that the government is all powerful. Our fearless golfer promised in Portland, Oregon that "we will not be able to eat as much as we want any more! ", to cheers from the listeners. He also promised that "we will not be able to eat what we want any more! ", again to loud and prolonged cheers. He also promised an increase in gasoline prices. He also promised a fundamental change in America. He is the only politician who has kept his promises. He has brought about fundamental changes in America. He has ordered the Department of Injustice to not enforce the Defense of Marriage Act. When the president requires that laws not be enforced, we have become a lawless nation. The Department of Injustice has overseen the illegal sales of assault weapons to a murderous gang in a foreign country. A gang that has shot up a sheriff's office in Texas. None of the foregoing are "made up facts", all can be verified. 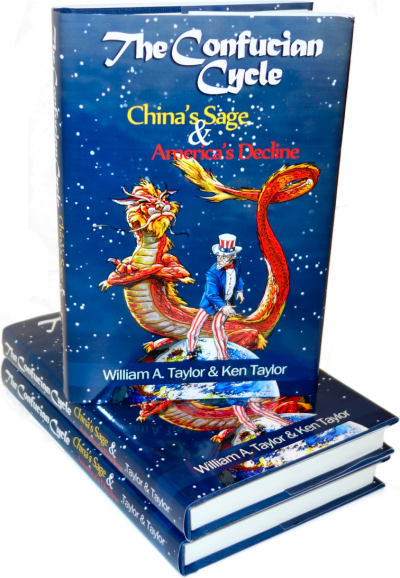 The fundamental change that has been made in America is the total ignoring of our founding document. Have you ever read it? It appears that only one member of Congress has ever done so. That would be Dr. Ron Paul, the Congressman from Texas. He is an honest man. He is running for President of the United States of America. Am I reading this right? Are you seriously claiming that ONLY the Democratic party is responsible for the debt? Since the two are peas in the current DC pod in the PR wrestling match, lets highlight Boehner to stand in this ring with Obama. Boehner built his career on being a conduit for passing public money to corporations. His major accomplishment was the (at least) $700 billion bailout of the big banks (TARP) which he helped punch through, after receiving four million dollars from the financial services industry over his career. Before that, he helped co-author the “No Child Left Behind Act,” a “grotesquely expensive expansion of federal power” which increased federal education spending by 80%. He also passed the obscene Medicare Part D, which Taibbi calls “a staggering $550 billion handout to the pharmaceutical industry.” He helped pass the Bush tax cuts for the wealthy lowering their rate from 40% to 35% – the lowest rate in the history of the USA. So there we have one Repukelican and one Demoncrap highlighted champion their parties ludi. Each party has their myth, and together they spin the top. 'Round and 'round it goes - and where it stops is major catastrophe. One party calling the other the party of lies is a double lie. Anyone who isn't familiar with the GWBush litany of lies is purposely ignorant...or lying themselves. Presidents have written executive orders requiring laws not to be enforced from at least the time of Reagan - who wrote orders to ignore the Bolen Amendment during the Iran/Contra era. What this nation neads is a good five cent amnesia preventative. This "fundamental change" you speak of has been a drip drip operation for decades. I have news for everyone - changing the puppet in the White House isn't going to make a spit of difference. "I have news for everyone - changing the puppet in the White House isn't going to make a spit of difference." I agree with that statement but for different reasons. No, there isn't any secret financial cabal running the world, but Washingtonian politics will corrupt anyone who is elected. And if they manage to not become corrupted, it'll be them versus everyone else so they won't get anything done. If Ron Paul was elected tomorrow and spent 10 healthy years in office it would be meaningless. There would simply be a stalemate for 10 years of him versus everyone else. Even Reagan, the best Prez since Coolidge, couldn't enact much of his vision because he was lied to and deceived by everyone around him. What we have here is not a failure to communicate, it's a failure, period. Mortal man (all of us) have failed. We turned away from God and followed OUR ways, not his. What we have here is just the beginning, barely the tip of the iceberg of the coming tribulation. Sinful man cannot and will not fix the problems that aren't confined to this nation. These problems are world wide. Our existence here has a shelf life, that's an indisputable FACT. Don't store up treasures here on earth but store up your treasures in heaven. This isn't life. Everything here, EVERYTHING is associated with death. The true life is after we leave here. Don't put your faith in man, put it in God. What's going to happen here is going to happen and it's not going to be pretty. Remember, each of us came here with nothing and that's exactly what we're leaving with. There is nothing more important than the salvation of your soul. Don't let the troubles of this world weigh heavy on you. God has a plan and a purpose for us. All he asks of us is to believe in Him. That is so simple that it truly does boggle the minds of the learned. Peace be with you all. [For Bitter Intrigue: FBI]Dave, You make a pretty bold statement here saying, " No, there isn't any secret financial cabal running the world." The statement is bold in that the current crisis is...well, obviously "financial." Well I can only say that it seems silly and diaper-dumper naive to hand-wave the legions of historical facts proving beyond reasonable doubt that there id indeed a secret financial cabal running the world. Oran Hatch has a favorite saying, "reasonable men can disagree." what is ludicrous is the timing of the instances that this mantra passes through his lips, and this has been while he is championing fascist, thugs and traitors, and covering for unconstitutional acts of chief executives, as your favorite president since Coolidge. Reasonable men may disagree, but they cannot change fiction to fact. The financial cabal isn't secret any more - but its still running the world. The drip-drop turned into a gusher in the last few years. The only difference between Bush and our fearless golfer is the color of the skin their wearing in this iteration of their evil souls. If we want to drop into the apathy of "Leg go and let God", then all hell will break loose. Well, I guess it already has. Changing the puppet won't make any difference, that is true. But if one who can think, and educate, really educate, gets elected, there won't be a stalemate. 10 years of Ron Paul would make a difference. Look at the changes wrought by his candidacy of 2008! He awakened a lot of people. If the Republican Party had allowed Ron Paul to win the nomination in 2008, his volunteers alone would have elected him. Sue Lowden shut down the convention in Reno, Nevada because Paul was winning. She run in the primary here for our seat filled by Reid. She had been a strong supporter of Reid up until the last election. She was the Democrats foil to win the election for Reid. In the end, the SEIU won the election for Reid through the manipulation of the votes cast - allegedly. The right person in the White House CAN make a difference. I am not convinced that all is lost. We can, and most probably will, get ourselves out of this hole, if we quit digging. Okay...I have just had the weirdest thing happen yet on the Internet. I was on the Jeff Rense site and clicked 'The Zionist Connection To The Norway Massecre' - it sent me to my own mailbox, to my own email address. WTF?? I thought I had made some sort of mistake so I X'd out of that second gamail window, and went back to Rense and tried again. AGAIN I was sent to my own mailbox. Now what sort of homeylander discurity algorithm is embedded there to pull this one off? One that is most likely following my keystrokes here and now. Boy howdy and panoptic thrillers in full color and prime time daddios. Willy, without seeing the actual page, I'm guessing that what you clicked on was a "mailto:" link that told the browser to open the "default email client" installed on your machine. This is a standard part of the HTML standard and works in virtually every browser. If you pass over the link, I'll tell you exactly what it is. Using the "Jeff Rense" details you passed earlier, I was able to figure it out. Those Google Mail links are the standard links that open Gmail for any Google users. If your username and password are already "signed in" for the current browser session, it will automatically open your mail. No conspiracy here. No tracking. Just a mistake by a webmaster that led to a predictable event. Ah, thanks for the tech info Ifon. Henry Makow has passed the problem on to Rense...might just be what you said. Yea, as you note, it had me freaked a bit. But your explanation makes densse. Excellent comment. It's always good to remember the eternal as opposed to the temporary. Unfortunately for all of us, our politicians have lost sight of the eternal. They have even lost sight of the near term, and are focused only on very short term political advantage. Obama seems obsessed with every tick and tock of his popularity, the others are just as bad. The media re porting that lots of phone calls came in when Obama asked people to call their senators. Any idea how the calls are running? Of course the caveat is in the word “mainly” in the last part of the sentence. This definition is the PR version given by pundits. In fact the version we see today of 'capitalism, is far from “free market” - it is controlled and manipulated markets by high finance. First, I fundamentally agree with the article. That being said it seems to me that the congress passed laws that were signed into law. It is not responsible to simply not pay for them. It is the law that they need to be paid and not paying them would be in violation of the law. While it is not responsible to run up ones debt it is also not responsible to simply decide you don't feel like paying it. It appears unavoidable that we will have our credit rating down graded as S&P has stated we will likely lose our AAA rating unless there is a medium term solution with 4 trillion cuts/revenue increases. Loss of the AAA rating will be incredibly expensive. That alone is a good reason find a large solution that includes an increase in the debt ceiling, or enough cuts that we never actually hit it. Yes indeed, that is exactly what I was getting at. How does this argument work in the real world? If the conman who talked you into a ponzi scheme were to make that argument to you after you had dumped your life savings into his bottomless pot, and he were back telling you that you still owed the interest that is in the fine print of your contract, would you think that well yea, I did sign up, I am liable? ... meeting Social Security obligations in August, September and all future months in this fashion would add nothing to the gross government debt subject to the debt limit. Not, at least, until the $2.4 trillion Trust Fund is exhausted in 2038. If issuing Social Security checks does nothing to immediately affect the debt limit, how is it possible that Social Security would be at the top of the expenditure cut list? The reason is simple and stems from the constitutional question that arose from a federal program in which all citizens were required to participate. In Helvering v. Davis (1937), the Supreme Court upheld Social Security's constitutionality because "The proceeds of both [employee and employer] taxes are to be paid into the Treasury like internal-revenue taxes generally, and are not earmarked in any way." As a result, the federal government can apply the revenues collected from Social Security payroll taxes, and the income taxes collected on benefits collected from higher-income individuals, to any government liability. Now we find out the biggest lie of them all! People said, "I paid in, I'm entitled to my social security." Way back in 1937, the Supreme Court ruled that what people paid in SS taxes is "not earmarked in any way." So they can spend it on anything they like. It's NOT insurance, it's just another tax. That's the monster lie! We made our decisions as a nation, we decided to spend the money. People have made their decisions on the belief that the money will be there. We promised to pay them. The nation did not sign up for a ponzi scheme. The nation created the scheme and yes when you create the ponzi scheme you do have to keep paying the people back. I want significant reform, at the very least, of government aid programs but to simply stop paying them is not responsible. These are obligations that the government has agreed to pay. Just like a mortgage with a balloon payment, you should not have agreed to the terms but since you did you do have to keep paying it. To walk away is highly irresponsible. Good post. A possible solution would be that on the one percent proposal by Rand Paul. That being for the government to cut spending from the previous year by 1% for 6 years and at that point you would have a balanced budget. The real cutting that this proposal does is cut out the automatic increases in the federal budget which is budgeted at about 7% a year. This would take away the "candy" money that the rock stars in congress have to dole out to their districts. They would not like this. It seems to me to be a responsible way to get to a balanced budget as opposed to going cold turkey. While I would obviously have to see the details to support that specific bill, I that definitely does sound like a great concept for bringing down the deficit in the short term. Longer term the fundamentals of social security and medicare (among others) need to be reviewed. The tax system should be (re)simplified by eliminating loopholes entirely for both the rich and the poor. If the tax rate is 15% you should pay 15% regardless of if you own a house, have a family, own a solar panel, or always take your vitamins. You're right about being responsible. Very well said. This is one of the problems conservatives have to face. Libertarians say "heck with them, all entitlements should be ended!" which is not only politically impossible but morally irresponsible. As conservatives, we are faced not only with the burden of getting rid of wasteful liberal spending policies, but also doing it in a responsible way that keeps made promises. This is why I don't support ending SS by declaring that everyone under the age of 35 loses their contributions. Contributors have been made promises, and those promises must be kept. While SS is bad governance through and through, and should be ended, current contributors should be given what they paid in. you are correct, we SHOULD keep our promises, but that's simply impossible. Scragged recently posted, or cited, or something, a USA Today article which added up all the pension promises and aid promises and SS promises and Obamacare promises as best they could. It came to a half-million per household. I think I remember Ifon saying something about it not being possible to pay that, now he says we ought to keep our promises. Ifon is right in saying, "This is one of the problems conservatives have to face. Libertarians say "heck with them, all entitlements should be ended!" which is not only politically impossible but morally irresponsible." HOWEVER, a problem liberals have to face is that there is simply no way short of massive inflation that we're ever going to pay off a half million per household. There's a county someplace down south went broke. They stopped paying their pensions, but thanks to the EPA, they have to keep paying for their sewer system. Sewer rates went so high that businesses closed. So much for paying it off! Bankruptcy exist for a reason, ifon, in that it is generally better than the alternative. We may not be there yet but we are really close. A half-million per household is out of reach & Obamma's reaching for a million as best he can. At the very last minute, county commissioners in Jefferson County, home to the metropolis of Birmingham, Alabama, decided to postpone a final decision on whether or not to declare bankruptcy over their excessive indebtedness. The bonded indebtedness incurred to build a state-of-the-art sewage treatment plant exceeds $3 billion, far beyond what the county can afford to service. And raising sewer fees for a fourth time in ten years isn’t an option as the outrage from the last increase still reverberates. The sewer system cost more than $3 billion. says the county had 658,466 people in 2010, so the sewer cost $4,500 per person. No wonder they can't pay. Now what, Ifon? What say, Jonyfries? It's perfectly possible. You just mentioned the first way - through printing more cash and bringing on inflation. The second way is by promoting revenue increasing programs, such as incentiveizing jobs in the US (ending all corporate taxes) which would give us the cash we needed to pay everyone back. The US government brings in $200 billion *per month* in current revenue. If we all got on the same page about what works and what doesn't and got a little creative, we could easily pay back SS contributors. How about a few details. "promoting revenue increasing programs"..are you suggesting more bailouts? "incentiveizing jobs in the U. S.
Get real, pal. Are you suggesting more government involvement in getting more "revenue increasing programs"? There has always been "revenue increasing programs". Its called working. Getting a job or creating one. I talked earlier to a gentleman who is going to close his business because he can't meet all of the requirements of Clark County, Nevada. As he closes the three businesses that he has, he will also be putting three others out of business that were using his office space. They will no longer be working because the landlord built a wall in his building without obtaining a permit. 6 or 7 people will be out of work because of this stupid rule that one can't build a wall on his own property without a permit. There is a fine, and the wall will have to be torn down. If the wall is rebuilt, a permit will be required, and inspections made, the inspections will have to paid for, as well as the destruction and reconstruction. Quit regurgitating the puke you hear on TV or read in some so-called newspaper. Among the businesses to be shut down that I mentioned, is a small weekly CONSERVATIVE Newspaper. I really don't want to insult anyone, but no one yet has made a suggestion, myself included, has made a suggestion as to what we can do now. RIGHT NOW!! Nate has some facts that he has shared, WW has berated us, and I think it is what is called "tough love". Grow the hell up. Suffer through a forced fast of only 2 days. Go to bed hungry every night for 3 months so that your children won't. If that won't "incentivize" you to "promote revenue increasing programs" you will never wake up. Robert, what in the holy hell is wrong with you? Did you go over to Willy's house and swig whatever crazy water is coming out of his faucet?? I said NOTHING about any bailouts. I've HATED every bailout program the government has ever done. Bailouts don't create revenue, they burn revenue and redistribute wealth. Robert, calm down and think for a second. One, two, three... Okay, now here we go. I said we - *WE* as in you and me - should get creative, not the government. I suggested that we could do this by incentiving corporations to hire people in the US byt ELIMINATING CORPORATE TAXES. Does that sound like a big government program? Does that sound like a handout? Hear's the solution you're waiting to hear "right now". Eliminate all income taxes and implement FAIR or flat (w/ prebates). Every corporation on the planet, both US and non-US, would want to start building factories here for two reasons: a) they'd have no taxes to pay on profit and b) they could spend less on salaries because withholding tax and FICA would be eliminated. Non-US corporations would want to start building here because they sell most of their products here. It's cheaper for Nokia to build phones here than build in China and ship half way around the world once their US costs suddenly plummet. The reason this increases federal revenues is because the population would start expanding and consumers would be spending at significantly higher rate, being able to keep every last dime they make. Even if they sat on it and invested/saved the money, that still creates jobs and expands GDP (I don't need to explain this to you, do I?). Bottom line, we'd be taxing consumption, not income and labor. When you came to this community, you were calm and rational. Evidently, you've been taken in by Willy's big lexicon and Dan Brown sense of imagination. This is the problem with conspiracists - beyond they fact that they're solution-lazy, they're seductive for the weak minded. I had not previously thought you were such a person. "Suffer through a forced fast of only 2 days. Go to bed hungry every night for 3 months so that your children won't. If that won't "incentivize" you to "promote revenue increasing programs" you will never wake up." I personally employ people, do you? I pay more in annual taxes than several people under the poverty line EARN in any given year. I am already "promoting revenue" myself, never mind the government's laser-like focus to get in my way. Instead of buying into Willy's lazy conspiratorial nonsense, how about YOU grow the hell up and start educating people around you. It's easy to believe conspiracies. It gives you a way out ("well, the International Bankers run everything anyway!") It's much harder to roll your sleeves up and fight liberalism hand to hand. "Allow pure capitalism and man's ingenuity to work unfettered and our revenues will explode"
And this has been proposed a thousand times on this website by both commenters and authors. Only we've been badgered endlessly by Willy that we're "blinded sheeple" and "capitalism isn't really capitalism, etc, etc" over and over again. We're proposing real solutions, Robert. Are you listening? Or have you been seduced by conspiracies? And another thing... This whole "stop attacking Willy" stuff is garbage. You need some perspective. Go back and read the comment threads for the last 40 or 50 articles. You will see (literally) hundreds of comments by Willy, sometimes a dozens times on a single article, attacking the authors and other commenters over and over again without any reason whatsoever. In recent weeks, he's tamed a hair, but originally all he did was attack and snarl and snipe and badger whenever a commenter offered an opinion of any kind. At first, I simply ignored his babblings. Then I asked him a few questions. Seeing how deeply committed he was to his beliefs, I returned to ignoring him. Then, I got fed up with the harassment and started punching. Dad taught me, way back in elementary school, that eventually you have to punch bullies back. It's the only way to slow them down when ignoring them doesn't work. Some recent readers have recently joined the site (welcome! by the way) but you need to get some perspective on the site-hijacking and name calling that Willy has engaged in for months on end. As I said, go back and read the comment threads. You'll see weeks and weeks of him attacking everyone who dares raise a head to post or comment with no one saying a word. I'm not sure why he doesn't simply go build his own website and try building his own audience the good ole fashioned way. I guess it's easier to seek out other established audiences and try hijacking the conversation. As we know, conspiracists are lazy. There are those that would be intellectually unarmed in a debate if they were allowed to be judged. These people are really irrelevant. Be confident in your principles and continue to keep the debate going with rational people. "Neither party is blameless for the decisions that led to this debt." The fedgov currently takes in $6 billion per day in taxes. It pays out $10 billion per day. I've been watching this tsunami of red ink ever since I majored in economics and political science 25 years ago. It simply is not sustainable. Now I hear talk of a government shut down. One can only hope. Several years ago I approached a small hotel here in Las Vegas regarding their unused restaurant. I offered to open the restaurant, if they would let me have it rent free. Their guests had no breakfast service, and it was a long drive to a decent restaurant. They agreed. I would have the restaurant for one year at no rent. I would have to provide a continental breakfast at a discounted rate. At about the cost. Government fees to get started was $17,000.00, unless I cheated. The government agents told me how. For example, before I could get licensed, I would be required to post in cash the estimated amount of sales tax I would collect for a given period, I believe it was one month. The workman's compensation was an outrageous figure that I don't recall, I believe there were three different insurances that were required. There was no equipment to buy. Only government permission to buy. The free enterprise system does NOT exist. The multi-storied air conditioned offices for the government employees must be paid for. Their automobiles must be paid for. Their retirement must be paid for. They are not part of the SS system you know. They have a separate system. These are the things that must be changed. The fees charged by an out of control government with a bunch of lazy thugs holding down seats must be changed. Every incorporated church is operating only with the permission of the IRS and other governmental agencies. But we have "freedom of religion". Every commercial newspaper in the nation is operating after they have obtained permission from the IRS and other governmental agencies. We are free to assemble only after paying for and receiving a permit. Arrests for unlawful assembly are made so often, they are not even reported in the so-called news. Chance meetings of only 4 or 5 young black males are interrupted by the peacekeepers. If we are to have free enterprise, suggest to me how to get the cursed government from interfering with my right to the free enterprise. The suggestion that we be allowed to exercise our right to free enterprise is a dichotomy. Who is to make the allowance? From where did they get the POWER to interfere with any freedom? We are not to be interfered with when exercising our natural rights. Among which are the rights to Life, Liberty, and the pursuit of happiness. I should not be required to ask permission from anyone to exercise my right to garner my sustenance from the planet. But there is now a law on the books that requires me to get a permit from the government to plant vegetables in my front yard. If everyone with a front yard raised even a week's worth of vegetables, how much would the "greenhouse gases" be reduced, by the lessening of the truckers hauling produce from one end of the country to the other? I am not sure if the farm bill has passed, but a requirement of that bill would be that every one who planted a garden in their yard would be required to pay the federal government $500.00, and the government would tell you what kind of seeds to buy, and you wouldn't be allowed to dry your own seeds. I agree with both you and Bassboat. The free enterprise system worked in the early years of this nation. It can work again. Someone reportedly voted for the fool in the White House. That is the problem. Someone voted for John Boehner. Someone voted for Harry Reid. Someone voted for Nancy pelosi. Do you get the picture? Did you, Ifon, or you Bassboat, or you WW, get out and work in your precinct to get the right person elected? Granted, sometimes we are fooled, those of us who supported Joe Heck were fooled. But in less than two years, now, he will be replaced. But he will be replaced only if each and every one of us who care, gets out and does something other than comment on what is written by the editors of Scragged. You're right, Robert. I agree with every word you said. Conservatives have to be do the hard stuff - work at election houses, convert their friends, get rid of incumbents that stray from the fold (Boehner! ), etc. No, I personally have not done everything I can but I'm going to change that. As for a suggestion on free enterprise, the only thing that comes to mind is the same old tired (but true) mantra of Getting Back To First Principles. We have to vote for Constitutionalists and fight the GOP from within. Ken Hamblin once wrote a book called "Pick a Better Country" which basically said: don't give up because you can't. There's no better place to go. Commenting has been disabled for this article.